There is just something special about a car that is tricked out with accessories. If you are a guy, you know that your car is your baby, and you want it to stand out from the crowd. If you are a girl, you feel like you are driving the hottest car on the planet. There are number of different accessories that you can use to make your car turn some heads. 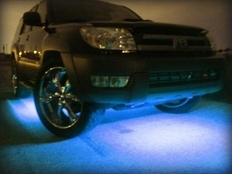 One of the options that you can explore to literally shed some light on your vehicle is neon undercar lights, which you can find at NewLevelMotorSports.com. Neon undercar lights come in a variety of colors to help supplement your ride's color scheme. Imagine how popular you will be if when out cruising for the night, as you pull in to meet with other car enthusiasts, you flip on your neon undercar lights. Other drivers will almost drop what they are doing so that they can come over and check out your ride. This exactly the kind of attention your ride deserves, to make sure to stop by NewLevelMotorSports.com to check out all the options we have available for you.